Hawa Mahal, “Palace of Winds” or “Palace of the Breeze,” is a palace built in Jaipur, located on the edge of the City Palace. It was built by Maharaja Sawai Pratap Singh in 1799, in the form of the Hindu god, the crown Krishna. The palace was built in red and pink colours sandstone, so it goes with the monuments of the “Pink City” Jaipur. The palace was named Hawa Mahal, because it was basically built for the royal household women to watch the festivals without being seen from the people outside. 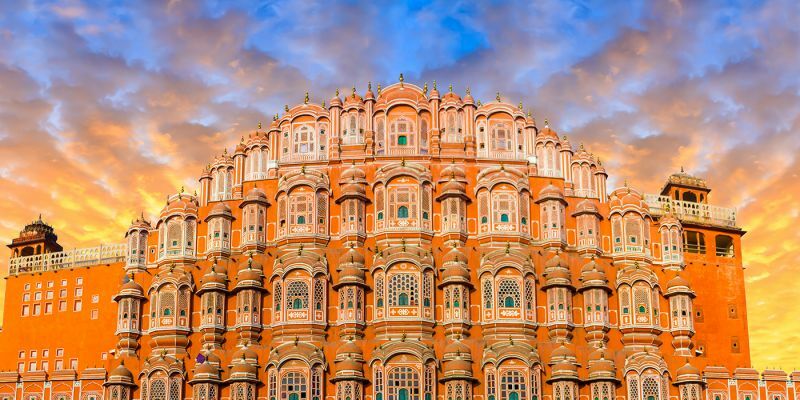 The Hawa Mahal consists of five stores in the shape of a honeycomb beehive, with 953 small windows called jharokhas decorated with latticework. It features stone-carved screens, small casements, and arched roofs, making it very popular for tourists. The windows were decorated back then with lattice, in order for the women to watch the everyday life without being seen by the people in the streets. In addition to that, it was to let in cool air during high temperatures in summer, by creating Venturi effect through the intricate pattern. The entry of the palace from the side of the City Palace is from an imperial gate. The gate opens to a courtyard, with double-stored buildings on three sides. The Hawa Mahal lies on the east side of the gate. There is also a museum in this courtyard. The palace’s cultural and architectural heritage reflects the combination of the architecture of Hindu Rajput and the architecture of Islamic Mughal. The Mahal is very valuable. Thus, in 2006, after 50 years, restoration works were undertaken on it. The corporate sector helped in preserving Jaipur’s historical monuments and the Unit Trust of India has adopted Hawa Mahal to maintain it.